Peace of Mind. Close to Home. 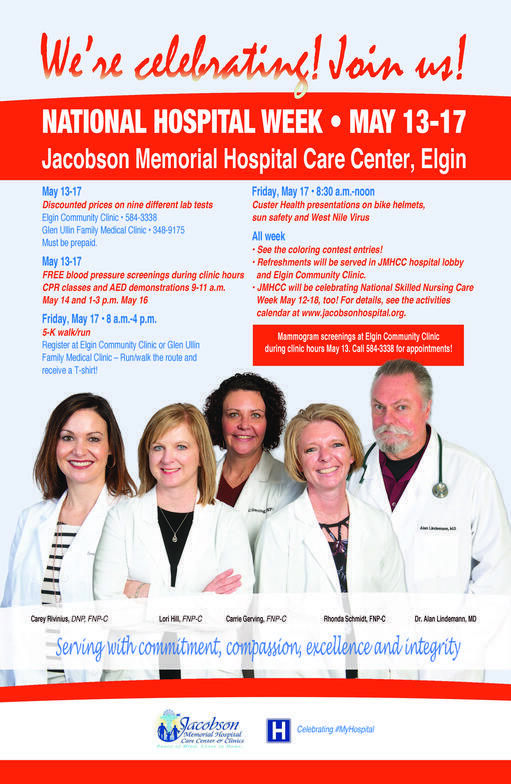 Jacobson Memorial Hospital Care Center and its affiliated clinics, Elgin Community Clinic and Glen Ullin Family Medical Clinic, care for you and your family with professional, quality standards and a genuine concern for your health. Dedicated to providing quality service with personal attention, Jacobson Memorial Hospital Care Center has been caring for Grant County and the surrounding area since 1977. Schedule an appointment today. You’ll find peace of mind close to home. JMHCC hospital and clinic patients may access their medical records through a secure online patient portal, by clicking the "Patient Portal" button.There, patients can view their medical charts or list of medications or schedule an appointment. 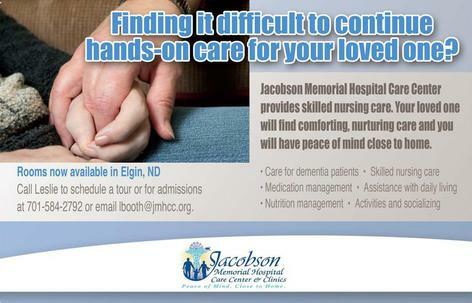 To initially access the portal, patients are asked to contact Linda Koepplin at JMHCC at 701-584-7273 to receive your personal pin number and a review of the portal. You must have internet access and be at a computer when you make the call so Linda can guide you through the process. “Strive to be the community choice by providing excellent health care through continuous improvement." Peace of Mind. Close to Home.